Sending you into the weekend with one of those meal starter ideas that I keep mentioning this month. 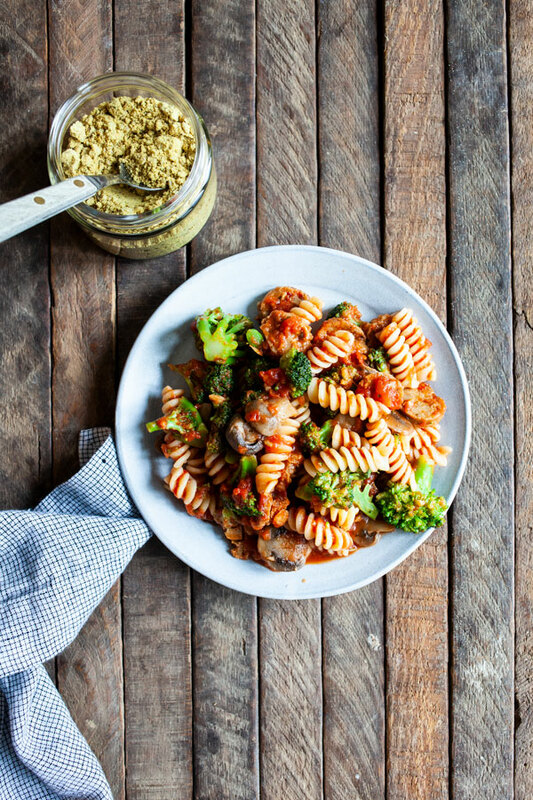 This easy vegan sausage mushroom marinara pasta isn’t a recipe (and I’m not sure that this share even constitutes a proper blog post! ), but it’s one of the re-heatable dinners I’ve made most often for sustenance and comfort food during my DI. On the chance that one of you might come to enjoy it as much as I do, it’s worth writing down the process. This meal definitely gets filed in the “semi-homemade” category. 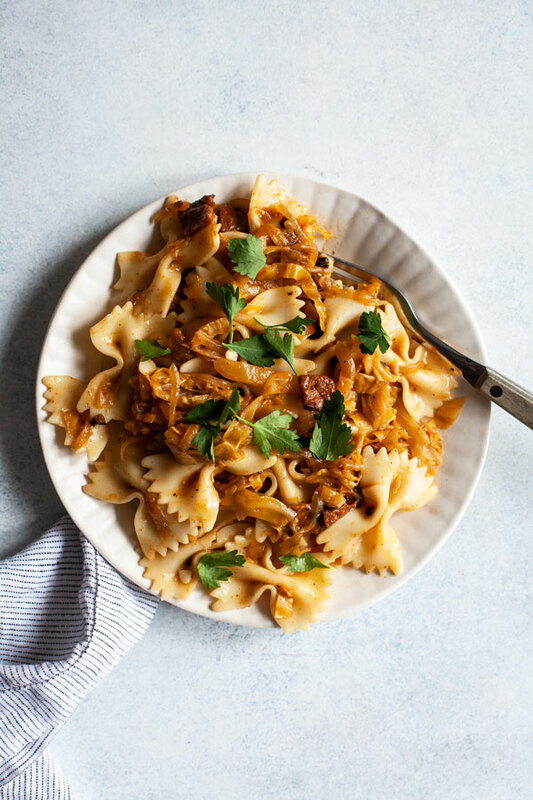 Within that, you’re encouraged to use any of the store-bought staples you like: your favorite marinara, your favorite vegan sausage (or you could use crumbled and sautéed tempeh, or cooked lentils), your pasta of choice (I used regular; go ahead and use gluten-free, bean pasta, whole grain—whatever suits you), and your favorite pasta topper. For me, that’s this walnut herb parm. 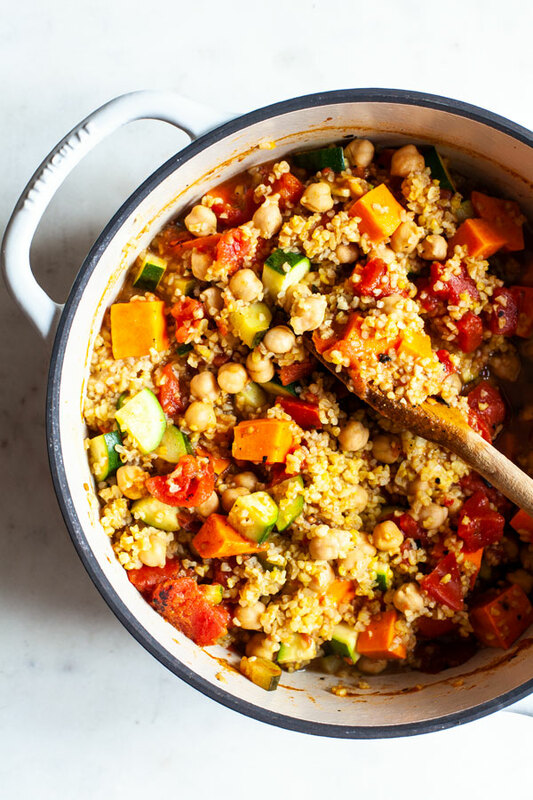 By the time the dish comes together, it’s filling, rich in plant-protein, packed with vegetables for nutritional heft, and—I think—pretty tasty for all of its simplicity. Here’s how I make it. Bring a large pot of water to a rolling boil. Cook pasta according to package instructions. While the pasta boils, heat the oil or broth in a large, roomy, deep skillet. Add the mushrooms and sausage slices. Cook, stirring often, for 7-10 minutes, or until the mushrooms have released their juices and are completely tender. Add the broccoli (if fresh) to the skillet, cover, and allow it to steam cook for 3-4 minutes, or until crisp-tender. If using defrosted, add the broccoli to the skillet and heat through. Add the marinara sauce and pasta to the skillet. Mix everything and heat through. 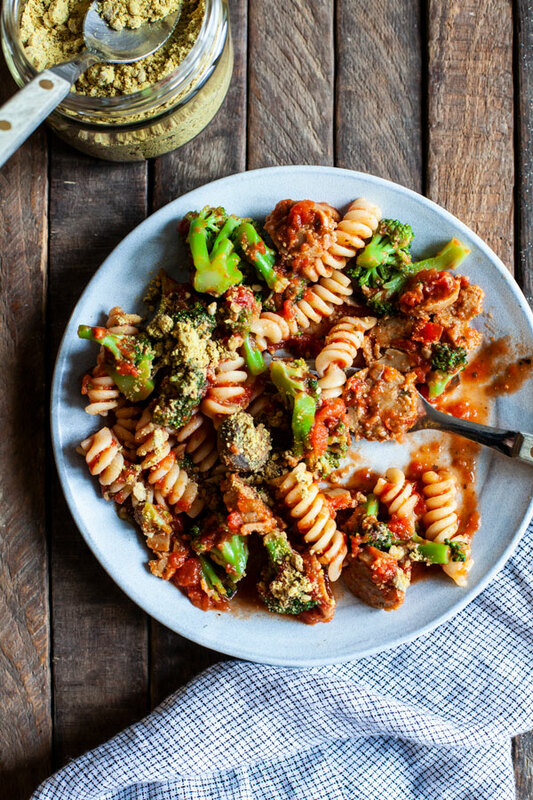 Divide into 4-5 portions and top with vegan parmesan of choice. This may well be a lot less inspiring than many of you need, in which case don’t worry: I have another easy recipe planned for next week, but it’s a little more original than this one! 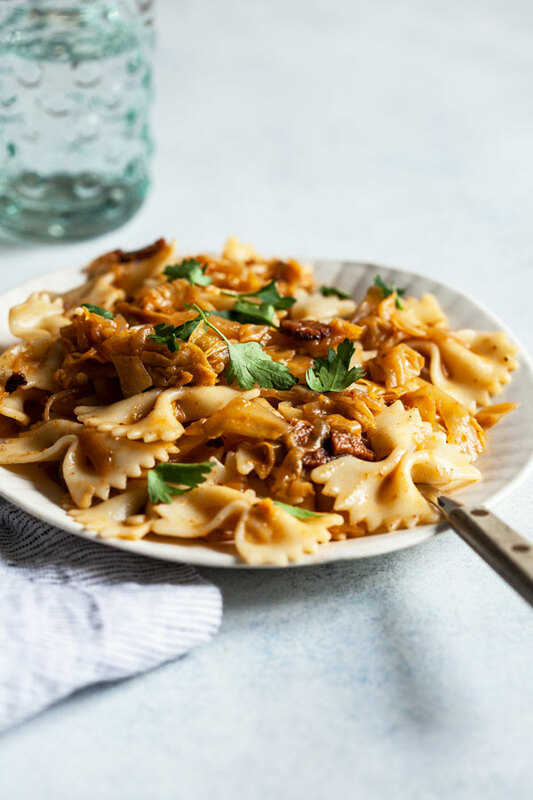 As I said, for those of you who might love this combination but not necessarily think to throw it together, I hope it’s a winning weeknight supper. Thanks for letting me share a low-key favorite with you. And I’ll be back soon, for weekend reading. My first boss used to joke that I’d probably be happy on a diet of mostly baby food. He said this because of my obvious love of mushy-textured foods, which I snacked on constantly at work: refried black bean dip, nut pate, and hummus. Especially hummus. My love of mush hasn’t budged as the years go by. If anything, it’s gotten deeper. I love not just mushy dips, but also mushy porridge, soft/mushy grain dishes, smashed beans, and mushy soups and stews. This is especially true when it comes to puréed soups: the thicker the better, which means the texture sometimes walks a pretty fine line between soup and mush. The soup begins with two whole heads of roasted garlic. It sounds like a ton, but the reason I’ve called for it is because the first time I made the soup, I only used one head of garlic. I liked the flavor, but I thought it could easily do with double the roasted garlic. Roasted garlic has none of the kick of the raw stuff, and in fact it gives this soup a mellow sweetness. If you’re very sensitive to garlic, of course, feel free to reduce the amount, but if your garlic heads are medium or small, I suspect you’ll find that two of them is just right. Otherwise, the soup is super simple. Roasting the garlic is actually the most time-consuming step. Once that’s taken care of, you just sauté some chickpeas and onion, add broth and salt, and blend it all up. Here’s how it comes together. Preheat your oven to 400F. Lightly drizzle the garlic heads with olive oil. Wrap each head in foil and roast for 45 minutes, or until the cloves are becoming caramelized and the garlic is very fragrant. Heat the olive oil in a large pot over medium heat. Add the onion. Cook for 5-7 minutes, stirring often, or until the onion is tender and clear. Add the chickpeas, broth (or broth + water), salt, and pepper. Transfer the chickpeas and broth to a powerful blender. Squeeze the roasted garlic cloves from both heads into the blender, too. Blend on high till the mixture is very smooth, taking precaution with spattering (the soup will be very hot). You can do this in batches if your blender is on the small side. You can also use an immersion blender. Transfer the pureed soup back to the pot and bring to a simmer. Add the greens and cook for another 7-10 minutes, or until the greens are very tender. Stir in the lemon juice. Taste, season as desired, and serve! If you like, you can roast the garlic 1-3 days ahead of time and store it in the fridge until you’re ready to blend. When I first made the soup, it was in the middle of a week of seasonal peaks and valleys temperature, sunny days and drizzle. I enjoyed it for many lunches with a hunk of homemade sourdough and a little salad. It felt like the perfect transition meal between winter and spring: still hearty enough to be warming and grounding, thanks to the chickpea base, but the puréed texture, spring greens, and burst of lemon made it feel fresh, too. I could imagine making it again very soon, as New York continues to ride the customary April weather. And although I love the chickpeas here, I’m also eager to try it with some white beans. Wishing you an easy transition between seasons this week, and I’ll see you back here for the usual roundup on Sunday. I’d originally thought of this as being a St. Patrick’s Day dish, thanks to the cabbage, but since that day has come and gone I’m just going to file it as another simple, flavorful, internship-inspired dinner idea. 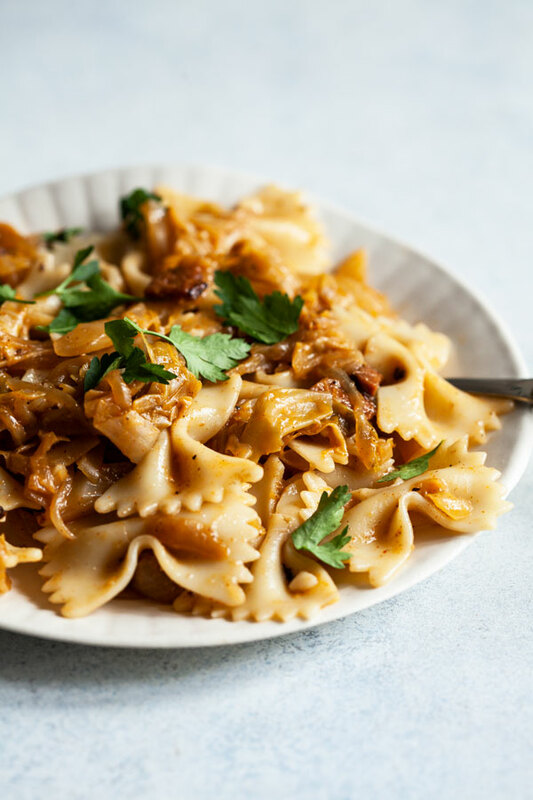 I realized as I was making this caramelized cabbage & onion pasta that I make much more pasta in the summer than in the winter. I guess that’s not surprising—pasta lends itself so beautifully to burst fresh tomatoes, zucchini, eggplant, and other summer produce. 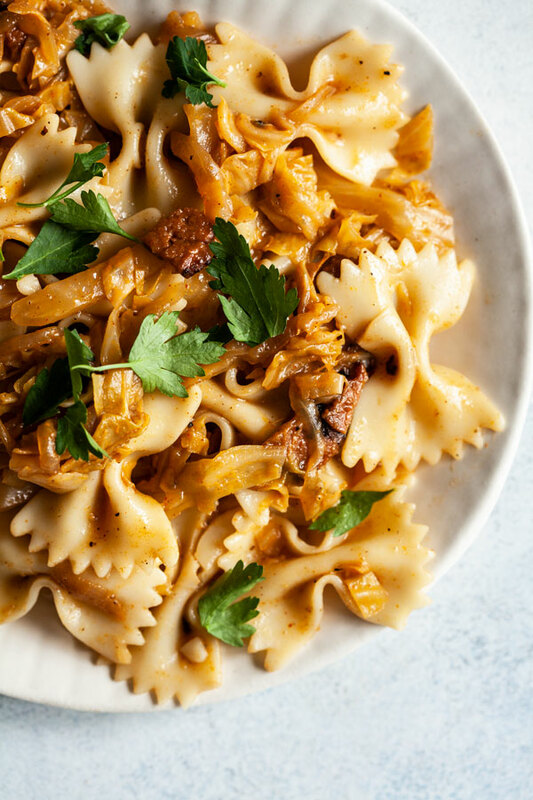 This dish encouraged me to combine pasta with two vegetables that I don’t usually associate with it—onion and cabbage—and I was surprised by how much I loved the results. The meal is incredibly easy to make. Simply caramelize some onions and cabbage (I started by cooking the onions for five minutes, then added the cabbage and allowed the whole thing to simmer for another ten minutes) and add some vegan bacon if you like. Olive oil is fine for caramelizing, but using a little bit of vegan butter definitely takes the meal to the next level. While you do that, you cook the pasta, and at the end, you mix it all together. If you like, you can even prepare the onions and cabbage ahead of time, and simply boil the pasta and mix it up when you’re ready to eat! I’ve made this dish twice now, and that’s how I batch cooked it the second time I tried it. The pasta is on the smoky/earthy side, so a little bit of fresh parsley and a tiny splash of vinegar are really nice to help brighten it up. The parsley adds color, too. If parsley isn’t your favorite, chives would be excellent, too. And, as I disclaim so often these days, you could easily add another chopped vegetable of choice (like leafy greens) to the mix. 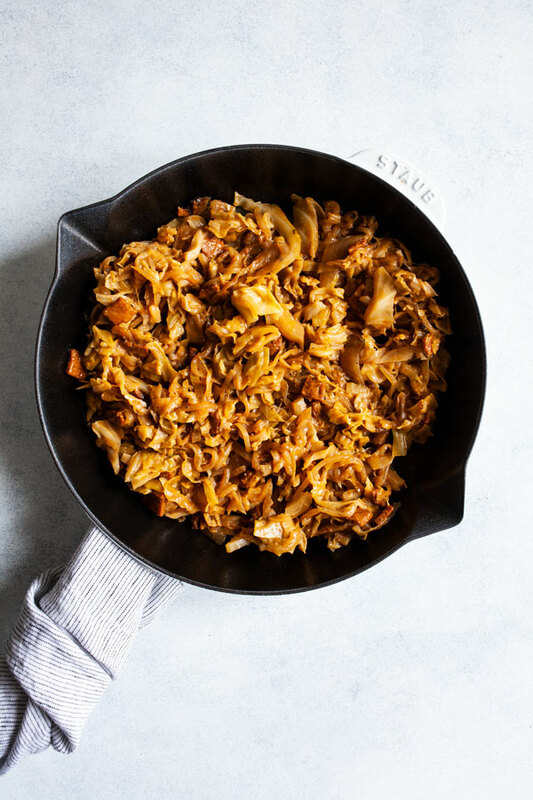 This simple pasta dish is full of smoky, earthy flavors thanks to paprika, cabbage, onion, and an (optional) few slices of vegan bacon. A perfect winter dish! Heat the oil or butter in a large, roomy skillet over medium-low heat. Add the onion. Cook, stirring every now and then, for 5-7 minutes, or until the onions are gently browning. Add the cabbage, 1 cup vegetable broth, and vegan bacon if using. Continue cooking the vegetables for 10 minutes, stirring often, or until the onions have darkened and the cabbage is very tender. If the vegetables get at all dry, add a few extra splashes of broth. While the onions and cabbage caramelize, cook the pasta according to package instructions. 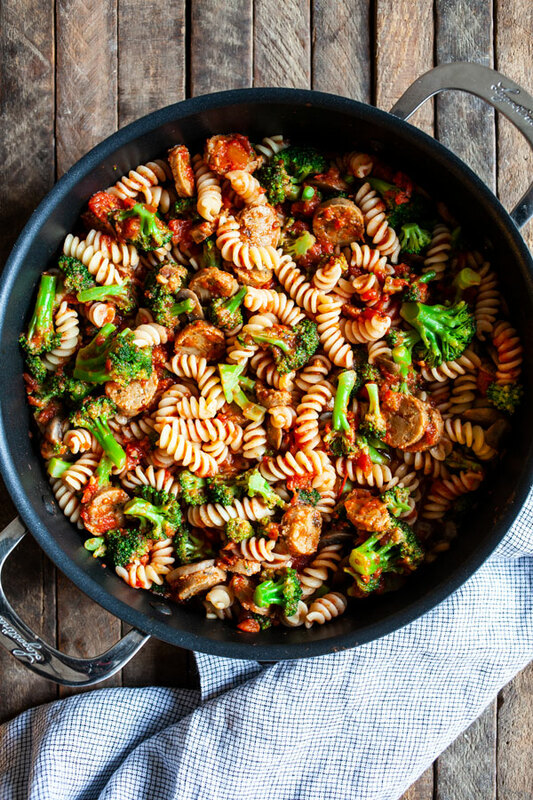 When the pasta and vegetables are both ready, drain the pasta and add it to the skillet. Once again, if the mixture gets a little dry, add an extra splash of broth. Warm all ingredients through. Taste, and then add salt, pepper, and/or vinegar to your taste. Serve the pasta right away with chopped parsley on top. I began an oncology rotation on Monday, and I’ve already learned so much—clinical knowledge and life lessons both. More on that soon, but for now, rest. Have a wonderful evening, friends. I’m debating whether I should keep including “simple” in my recipe titles, since simple food is the name of the game lately, and really since my internship year started. But I guess it never hurts to call it out. 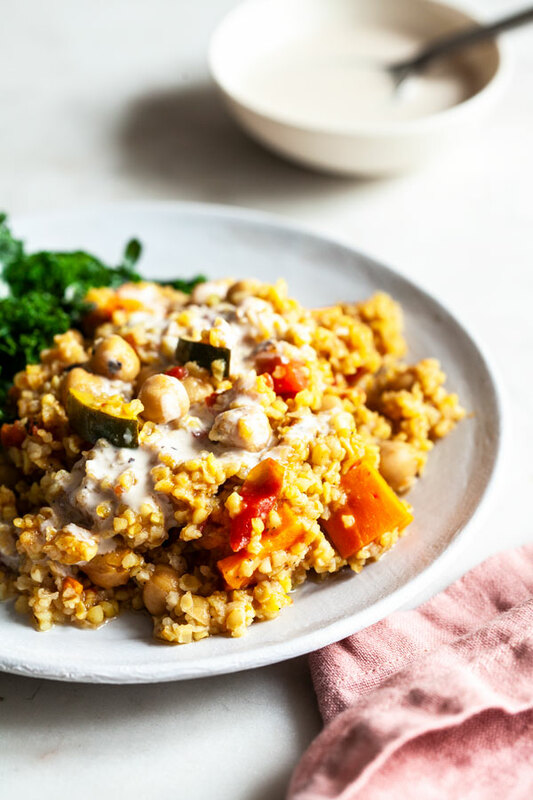 Anyway: this bulgur chickpea dish is indeed very simple, as the name implies. There’s some cooking time involved (though it’s worth saying that it can be shortened if you tweak the recipe ingredients a little), but the dish involves almost no active work. It’s as easy as mixing ingredients up and slow cooking, but in this case the oven does the work for you. 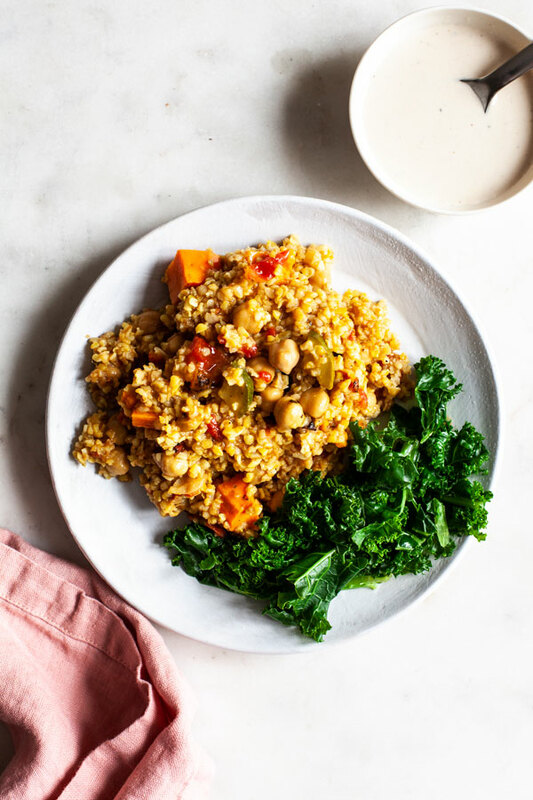 Beyond that, the recipe is full of nutrition—fiber, protein from the combination of bulgur and beans, adjustable on sodium and naturally low in fat—and incredibly easy to customize. I’ve been using a combination of chickpeas, sweet potatoes, canned tomatoes, and the un-seasonal addition of zucchini. Broccoli, cauliflower, green beans, and cabbage would all be great additions or substitutions. Speaking of that: I’ve tried the recipe with butternut squash in place of sweet potato and without either. 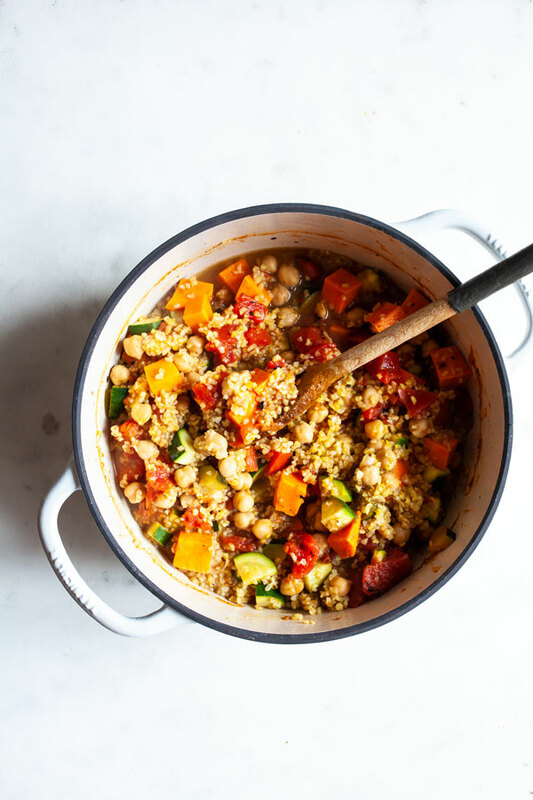 The cooking time can be reduced to 25 minutes without the sweet potato or winter squash; with one or the other, it needs a full 45 minutes in order for those vegetables to be cooked through. So if you’d like to make this in a pinch, you could try another, faster-cooking veggie instead. I kept the seasonings simple, but as I’ve been saying often these days, customize with what you have. Plenty of spices would be lovely in the recipe, including crushed red pepper flakes, which I didn’t add only because I tend to be conservative with spice. I don’t recommend skimping on the everyday lemon tahini dressing that’s linked in the recipe below; it gives the dish a touch of acid and creaminess that really enhances the experience of eating it! But if that dressing isn’t your thing, yum sauce or delightfully green tahini dressing would be great, too. Here is the nourishing, hands-off, and simple indeed recipe. 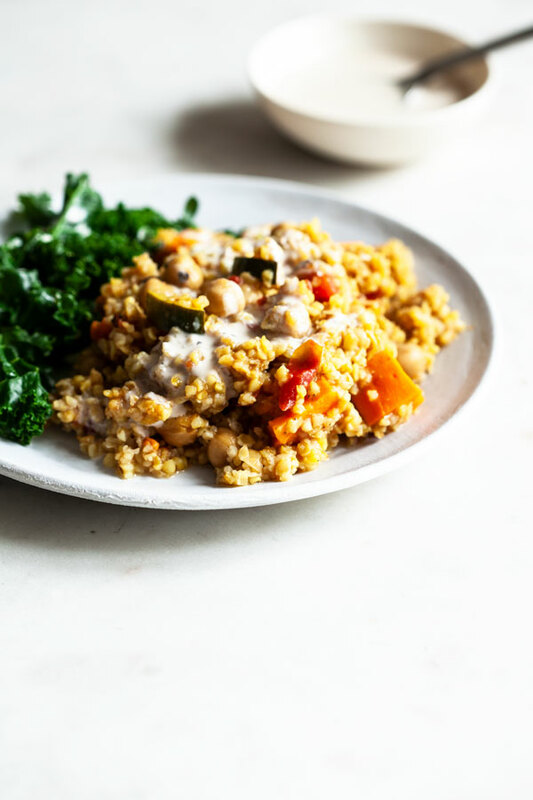 This dish of simple baked bulgur & chickpeas is rich in fiber, protein, an array of phytonutrients, and it’s easy to prepare. Served with a bright, creamy tahini dressing! Preheat your oven to 375F. Mix all ingredients together in a Dutch oven, a cast iron baking dish with a lid, or any other casserole dish with a lid. Cover and bake for 35 minutes. Remove the lid and bake for another 10 minutes. While the bulgur bakes (or ahead of time) make the everyday lemon tahini dressing. To serve, drizzle the bulgur generously with the dressing and enjoy! To shorten cooking time to 25 minutes covered and 5 uncovered, omit the sweet potato or replace it with a faster cooking vegetable (like cauliflower or green beans). This recipe is a truly perfect option for meal prep/batch cooking, since it can simmer away in the oven while you do or prep anything else you need. And it makes generous portions: enough for four hearty dinner components (I’ve been serving it simply, with steamed greens and lots of the dressing) or six portions if you’re using it as a side dish with something else that’s substantial. No matter how you serve it, I hope it saves you time and gives you pleasure. This week has been busy so far, with a nutrition workshop/conference yesterday and my final week at my current internship site. I’ve used my evenings to get grounded as best I can and my mornings to reflect on things during my commute. It’s all a work in progress…but it’s progressing. Happy Wednesday, friends!